Spray 5- to 6-quart slow cooker with cooking spray. In slow cooker, stir together parsnips, turnips, carrots, onion and garlic. In 12-inch skillet, heat oil over medium-high heat. Sprinkle beef with salt and pepper; add to skillet. Cook until browned on all sides. Place beef on vegetables in slow cooker. In medium bowl, stir together broth, wine and tomato paste with whisk. Pour over beef. Cover; cook on Low heat setting 8 to 10 hours or until beef is very tender. Serve beef with vegetables and cooking liquid. Garnish with parsley. 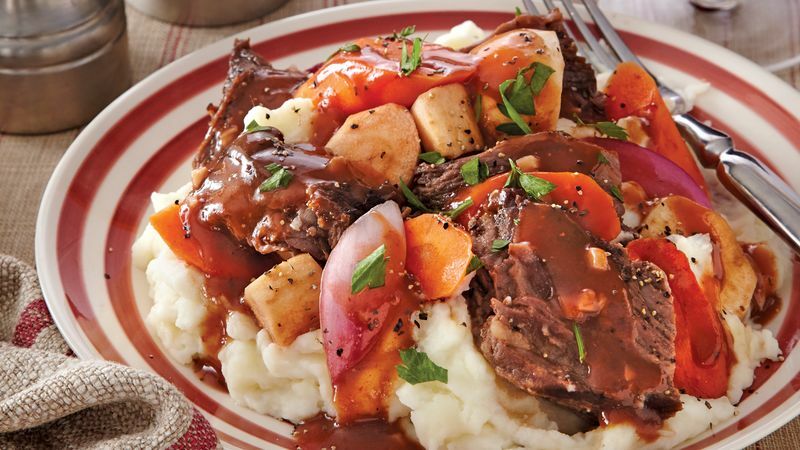 Pair this simple pot roast with mashed potatoes or, for an Italian flair, try it with polenta.